House Tour: The Elegant Courtyard Patio — KTJ Design Co.
Our clients living room has two large French doors (see last week’s blog to read how we designed it) opening into a lovely courtyard patio. This allows for the convergence of indoor and outdoor living, cozy and perfect for entertaining simply by adding the right outdoor furniture and accessories. We opted for an outdoor loveseat instead of a sofa and faced it west so our clients could catch the gorgeous view of a California sunset. We selected furniture made with UV stabilized, wicker fiber that is woven on fully welded and powder-coated heavy gauge aluminum frames. This furniture will remain beautiful, rust-free, and easy to maintain for many, many years. We added a pair of comfy chairs on either side of the loveseat to form a half circle arrangement, which makes the space feel large. Occasional tables with lift-out centers serve as extra storage (we all need that). We were careful not to add too many pieces here so as not to make the space feel overwhelming or crowded. Adjacent to the seating area is a long table, big umbrella, and more comfortable chairs. 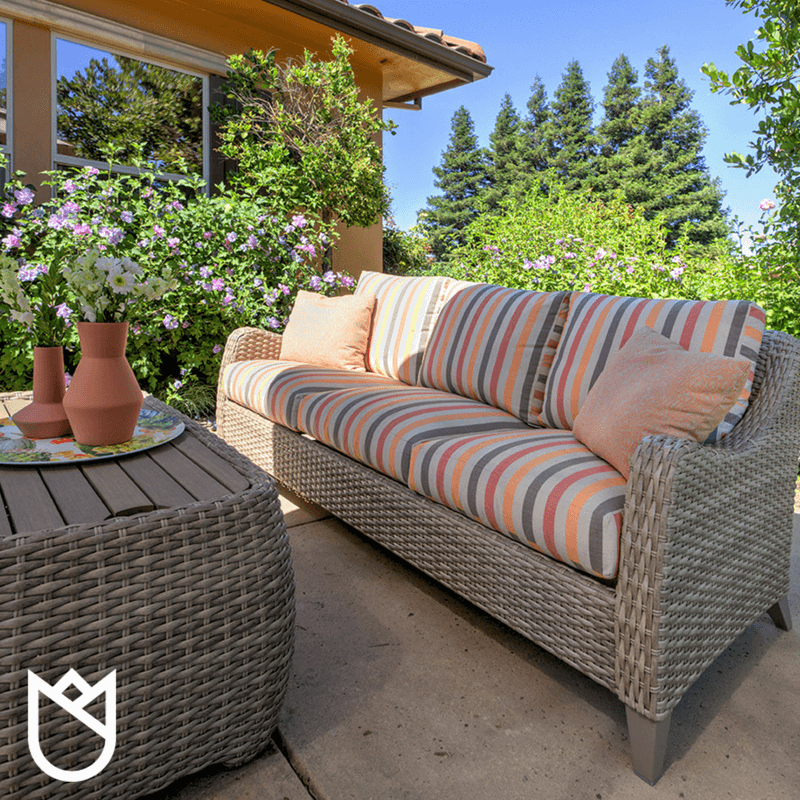 The cushions are covered with Sunbrella fabric and made with trademarked resilient centers which allows moisture to drain through and dry quickly (no more mold and mildew). The dining table top is made of an engineered polymer composed of virgin plastics, creating the appearance of natural teak wood while remaining water-repellent and stain-resistant. We suggest adding personal touches to your outdoor spaces, such as lanterns, candles, and greenery. Various colored and patterned pillows make the spaces feel just as elegant as the indoors. Creating a connection between indoors and outdoors makes your home feel more expansive and encourages the flow between indoor and outdoor rooms. Ready for an indoor / outdoor lifestyle? We can help. Click here to book a design consultation.